Political events generally do not have major impact on International Commercial Arbitration. However, some recent political developments have resulted in significant geopolitical uncertainty with emerging challenges to the international law and order. It may also impair businesses’ confidence in arbitrating in the affected jurisdictions. Brexit is one of the major challenges for the European Union and concerns arise mainly from its socio-economic impacts such as trade barriers, financial institutions, etc. The English courts have been always supported in the recognition and enforcement of arbitral awards. London is an established seat of Arbitration favored all over the world. The biggest question that arises after Brexit is its long-term impact on the International Arbitration Community. It however depends on the perception of local courts in EU Member States to take the risk of disregarding EU law by UK seated arbitral tribunals. London’s relationship with international arbitration is reciprocally dependent as well as beneficial on the other hand. The latter kind is more widely practiced within the European Union. The European Court of Justice (CJEU) has long held that intra-EU anti-suit injunctions are incompatible with European Union Law. [i] The decision in the West Tankers case (Case C-185/07 Allianz SpA v West Tankers) meant that under the scope of Brussels Regulation, an "anti-suit injunction" could not be granted in order to restrain proceedings brought in another EU Member State in case of arbitration. The Court held that an anti-suit injunction obtained in the English courts against a party who brought court proceedings in Italy in breach of an arbitration agreement was incompatible with EU Law. The judgment had significant implications for arbitration in Europe, especially in London since it follows a common law system. The London practitioners consider anti-suit injunctions in favour of arbitration as an essential to uphold arbitration agreements with a London seat (Gaffney, 2009). The practitioners of the Civil Law system took an optimistic approach and considered this judgment to be in accordance with the EU law. Post-Brexit, the situation may be set to change. Since the UK will no longer be a part of EU, the English courts will not be bound by EU jurisdiction or laws leaving a wider scope for London Arbitration Courts to grant anti-suit injunctions in respect of arbitration proceedings brought before EU Member State courts. The courts of EU Member States will remain prohibited from granting anti-suit injunctions. This might give London an advantage over Arbitration Seats in the EU such as Paris. The approach of the English courts to arbitration is arguably a far more attractive attribute of London as a seat (Cannon–Naish–Ambrose, 2016). However, the return of anti-suit injunctions would depend on EU-Brexit negotiations. International investment can be defined as a complex system of international agreements, multilateral as well as bilateral, and which are interrelated to one another (Juillard, 2001). The foundation of the international investment system is the Bilateral Investment Treaty (BIT). [ii] The European Commission has taken the clear view that BITs concluded between EU Member States[iii] are contrary to EU law and in 2015 launched infringement proceedings against Austria, the Netherlands, Romania, Slovakia and Sweden. With the EU's power over Foreign Investment, the EU Member States are not entitled to negotiate and conclude BIT agreements without the approval of EU. The European Commission is seeking to replace BITs between all EU and non-EU countries with EU negotiated investment agreements. The EU has negotiated various free trade and investment agreements with third parties. The UK currently has 12 intra-EU BITs with Bulgaria, the Czech Republic, Croatia, Estonia, Hungary, Latvia, Lithuania, Malta, Poland, Romania, Slovakia and Slovenia (Rogers – Goodall –Dowling, 2017). Post-Brexit, the UK will not be directly bound by the regulations of EU. There will no longer be any ambiguity regarding the validity of BIT agreements. The UK will regain its powers to negotiate and conclude new BIT agreements and may benefit from these deals. The EU's new policy of eliminating EU BITs could give the UK a competitive advantage over other European Countries after Brexit. Positive Impact or Negative Impact? Discussing the relationship between the UK and European Union after the UK’s exit is essential. Europe has many well established seats of Arbitration at Paris, Stockholm, and Switzerland. Post-Brexit, the competition will continue to grow in the global market for dispute resolution. 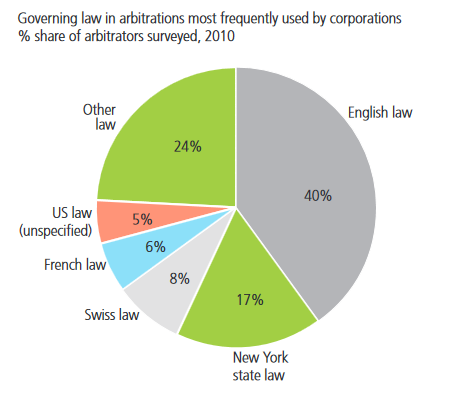 London attracts many cross-border arbitration disputes due to its lingua franca as English, attracting companies twice as likely to choose English law over other governing laws for international commercial arbitration. [iv] Moreover, London attracts many eminent judges and arbitrators. Some commentators have argued (Liu, 2017) that London could benefit from Brexit, because the city might be perceived as a more “neutral seat” and the English courts would no longer be controlled by the ECJ’s ruling in West Tankers case. According to the 2015 International Arbitration Survey, the five most preferred and widely used seats are London, Paris, Hong Kong, Singapore and Geneva. Post-Brexit, the English courts might enable EU-wide anti-suit injunctions. Many comparable jurisdictions such as Switzerland and France do not have anti-suit injunction protection. If this may be the case, London will gain advantage over other EU seated arbitration tribunals. However, the return of anti-suit injunctions largely depends on whether the UK still chooses to remain a party to the Brussels Regulation. By a similar token, the UK might be able to conclude more BITs with third countries with EU limitations which may allow investors to maximize investment trade. Brexit is not likely to have immediate consequences on arbitration; however, the changes seen will bring some positive impact on the UK as a seat of arbitration. Brexit has surprised the whole world and is one of the most important concerns politically and economically. However, it establishes a stronger arbitration system for London since the English courts are arguably the far more attractive attribute of London as an arbitration seat. The parties choosing to arbitrate disputes in London will continue to benefit from a “tried and tested” arbitration law and also the jurisprudence of the English courts created under that law. [v] The UK along with other EU Member States will remain a party to the New York Convention of 1958 which is not likely to impact London as a Seat of Arbitration in a significant way. It is however difficult to predict the long term impact of Brexit on International Arbitration. The UK will remain to be one of the most preferred seats for arbitration and the significance of the political impact on Arbitration will not be rigorous. [i] For a similar CJEU ruling see the judgment in Case C-159/02 Turner v Grovit..
[ii] BIT is an agreement between two countries that sets up rules and regulations for foreign investment in each other’s countries. [iii] Intra-EU bilateral investment treaties (Intra-EU BITs) are agreements between EU Member States establishing the terms and conditions for private investment by nationals and companies of one country in another one. 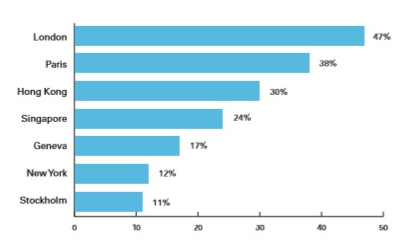 [iv] According to 2010 International Arbitration Survey: Choices in International Arbitration (Queen Mary University of London), the most frequently used governing law is English law (40%).